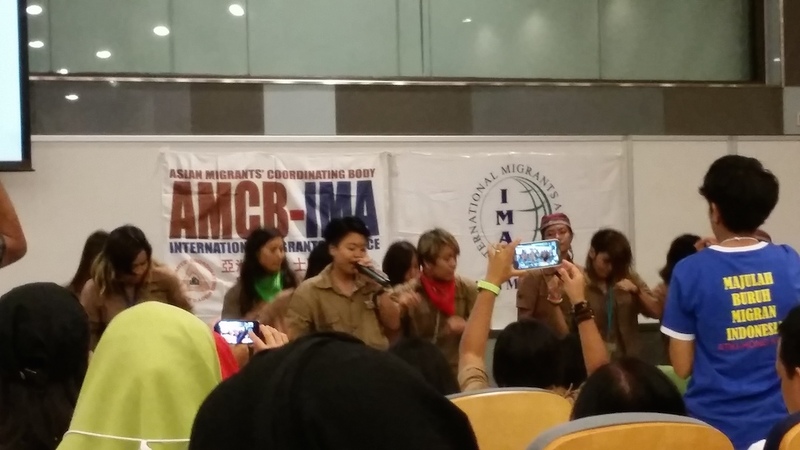 Yesterday was the 3rd Asian Migrant Workers Summit, organized by the International Migrants’ Alliance, held at the Hong Kong Polytechnic University. According to the South China Morning Post, there are about 320,000 foreign domestic workers (FDWs) in Hong Kong as of 2013, 50% originating from the Philippines, 47% from Indonesia, and the rest from Thailand, Myanmar, Bangladesh, Nepal, Pakistan and Sri Lanka. These workers are almost all female – to give a sense of perspective, in 2011 the HK Census reported that about 90% of Indonesian and Filipina women are domestic workers. The area outside the lecture hall was packed with women talking excitedly in a range of languages, moving between the packed registration table and the line for a bag of snacks. Many were wearing colorful hijabs and flowing skirts, others were dressed in casual jeans, shorts, and t-shirts. One group of women from the Indonesian group Beringin Tetap Maju (BTM) was especially interesting: they dressed in brown jumpsuits, individually decorated, and many wore their hair in short styles that, in the US, would be taken as expressing LGBTQ identity. There was actually a number of women dressed in “tomboy” fashion, wearing calf-length baggy jeans, open shirts rolled up above the elbow, and sneakers or boots (a “sexual alternative” discussed in Chang and Ling 2000). The women from BTM may, however, have dressed specifically for their performance. This kind of rhetoric about the relationship between local society, justice, and morality was really interesting. A short video introducing the IMA pointed to “neoliberal globalization” as the cause of FDWs’ suffering, noting that they are treated as “commodities” and “modern day slaves.” “IMA is progressive and democratic,” the video pronounced, and described their goal of “fighting against imperialistic oppression.” Speakers and dance performances followed in alternation, and the first section ended with an open forum. The video [Youtube] she played in conclusion was especially interesting for its gendered depiction of global inequality: men were depicted as the wealthy and powerful, while women labored in factories, performed domestic labor, and worked on farms, with all their money draining to the male icon. Tamar Park is located just north of the Central Government Complex, the Legislative Council Complex, the office of the Chief Executive, and the People’s Liberation Army offices and barracks; it’s actually closer to the Admiralty MTR stop than to the Central station. We passed buses and buses of policemen, many of them eating their dinners, and arrived at the park just at 7pm as the sun was setting and the crowd gathering. 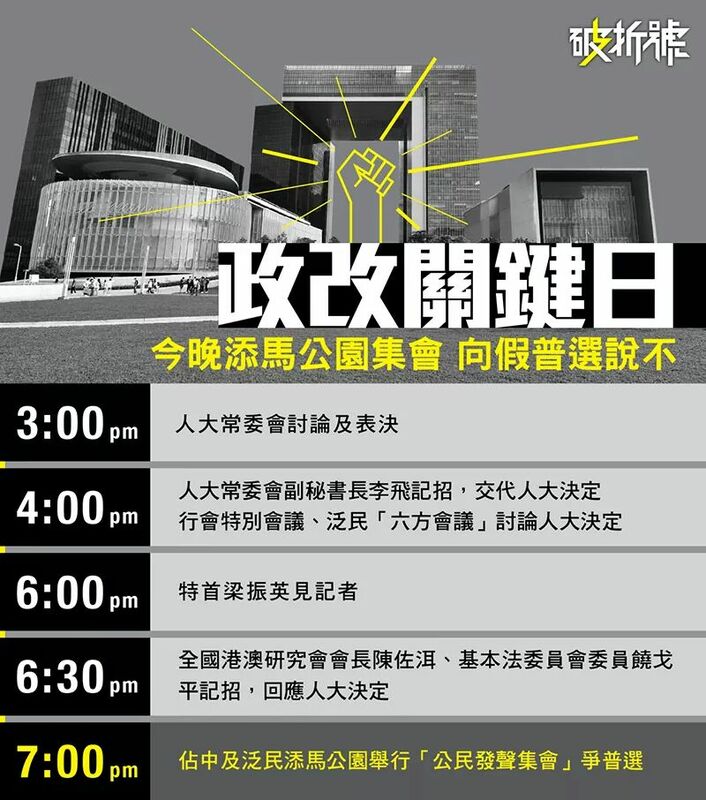 Some activists from People Power (人民力量), a radical democratic party, tried to give us flags, and people from Citizen Radio were giving out headbands reading “公民抗命” (“citizen disobedience”), but we declined. It’s unfortunate that Henry and I didn’t have an advanced enough grip of Cantonese to keep up with everything in detail, but we translated for each other and often I realized that my study of Mandarin was really helping me figure out Cantonese parallels so that I could understand the gist of most things. The speakers often adopted conversational tones, creating camaraderie between them and the audience; those who used the most formal language and were most difficult to understand were the student leaders and the academics (figures). One of the speakers talked about how our parents had come from China to Hong Kong to escape a repressive government. They warned us not to get involved with the government, he said, but he argued that they were different: they weren’t from where their parents were; they were from Hong Kong, and Hong Kong was their home, and the government was at their door. Some of the students broke down in tears as they talked. One talked about what Hong Kong had been like 30 years before, in the 1980s, when the Sino-British Negotiations had taken place and the Joint Declaration had been issued. He asked what Hong Kong would be like 30 years from now, emphasizing that Hong Kong was their home. “呢個地方係我哋嘅屋企,” he said, using the term for home (屋企) that is especially colloquial and familiar. As they stood on stage it began to pour. They declared that at the end of the gathering, some of them would march to the hotel in Wan Chai where they believed Li Fei, the deputy secretary general of the NPC Standing Committee, was staying. We will ask him why we don’t have true democracy, why our voices weren’t heard, and won’t leave until he comes out, they promised. One person whom Twitter helpfully identified as Chan Kin-Man called for the need to protest (抵抗) not mainland people, but mainland law. 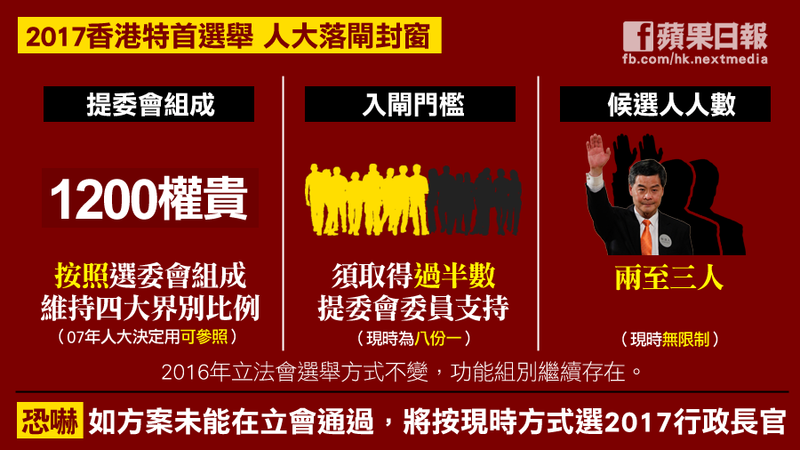 One of the scholars, however, made a connection to a mainland-Hong Kong controversy over milk powder that had made many Hong Kong residents angry with mainlanders: If we can have false universal suffrage, then we can have false democracy, and false milk powder. Perhaps he didn’t intend to reference being angry with mainlanders, but instead being upset with the system that caused the rush on Hong Kong products; nonetheless his pronouncement was met with wide applause. 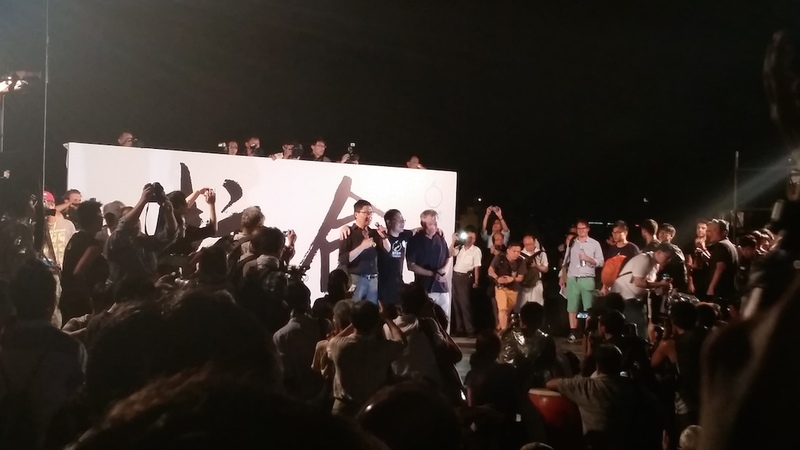 Martin Lee, the veteran pro-democracy champion, got on stage to speak. He expressed his desire to explain to the media the goal of Occupy Central, and so he was the only person to speak partially in English, while all others spoke Cantonese. Toward the end of his talk, he pointed up to a skyscraper beside the government offices bearing an electronic advertisement with red text on a white background (you can see it on the far left of the photo). He read it in Cantonese, then translated: “A new chapter.” Today, he emphasized, would begin a new chapter in the fight for democracy. Twice the speakers asked everyone in the crowd to lift their phones and turn on the torch function, so that we could see in the darkness how far the crowd stretched across the park. Finally, the photographers were invited on stage to take a photo of the thousands of phone-lit hands in the night to demonstrate the power and determination of Occupy Central. At 9pm, the organizers ended the gathering with very clear and precise instructions on calmly leaving the assembly. The people in the back and the sides first, the speaker said; people in the front, please wait, so we can show everyone what Occupy Central will be like and so that we won’t dishonor the good reputation of Hong Kong. And everyone left quietly and calmly. 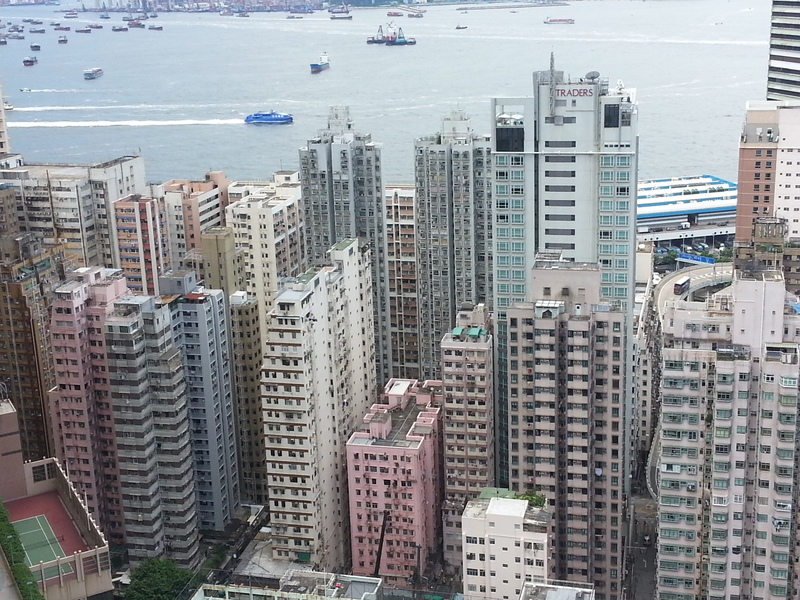 Henry and I left, too tired to think about joining the students in Wan Chai. *I know that in light of the “tomboy” discussion and alternative gender identities for FDWs, my usage of “women” to describe them is over-generalizing, inaccurate, and possibly offensive (?). My excuse for doing this is that most FDWs present as female; I only noticed tomboys at the summit but didn’t see any while walking around town (though I wasn’t looking too hard). For anyone who’s interested, Nicole Constable (1997/2007, 2014) offers some great discussions about how FDWs interpret and construct gender norms, as well as the impact of gender norms on FDWs’ decisions in Hong Kong; I referenced Chang and Ling (2000) earlier, and I’m sure there are other scholars working on FDW sexuality and gender.